thru tar and muck have they come. In the greater Chicago area, two life-sized statues direct our attention back ... to the mastodon that roamed Illinois and neighboring midwestern lands more than 11,000 years ago. Mastodons roamed North America from at least 3.75 million to 11,000 years ago. 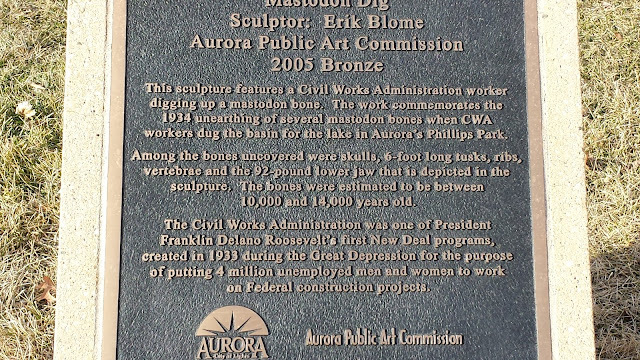 Philips Park in Aurora (a western suburb of Chicago) is home to the above animated form because mastodon bones were discovered there on March 7, 1934. The discovery of the 92 pound lower jaw of a mastodon is depicted in this sculpture by Erik Blome. The bones are estimated to be between 14,000 and 10,000 years old. The American mastodon was a distant relative of the elephant. It was an herbivore that fed on trees and lived in wetlands. This approachable mastodon in Aurora shows us that mastodons stood 7 to 10 feet high and weighed between 4 to 6 tons, slightly smaller than modern day elephants. 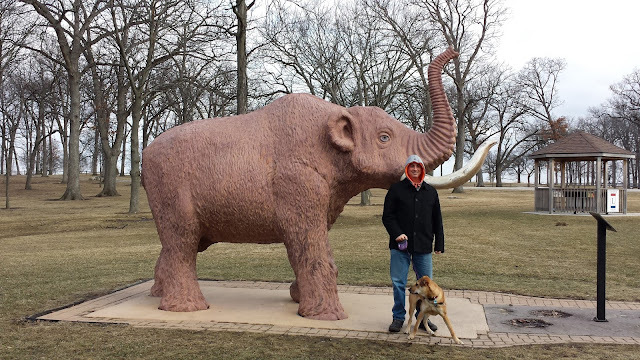 Early caveman and his dog encounter a mastodon in Aurora! 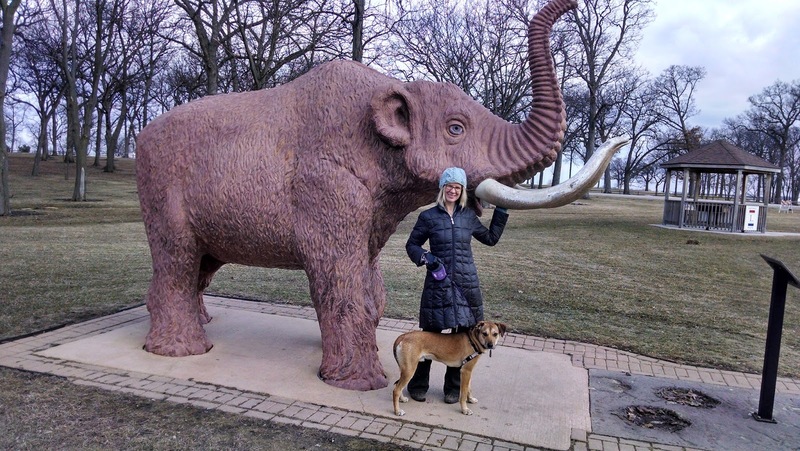 Mastodon remains that date between 40,000 and 11,000 years old have been found all over the Midwest. 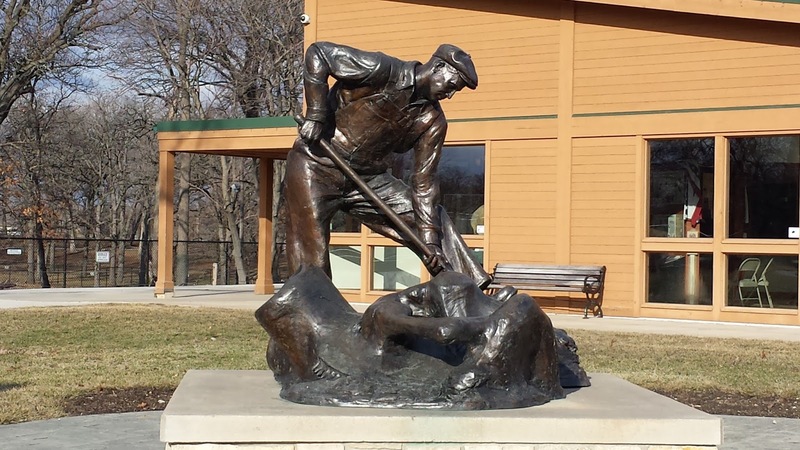 Philips Park in Aurora isn’t the only Illinois site to raise a monument illustrating this fascinating history. 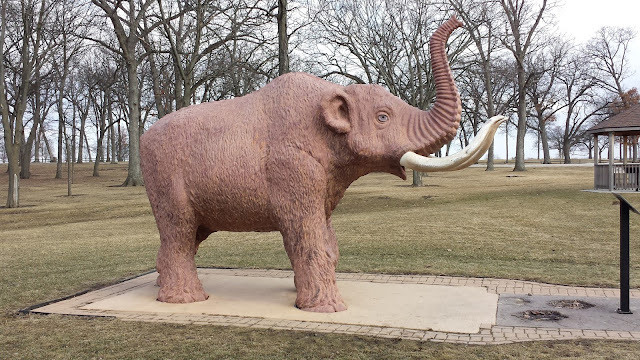 Lake County, Illinois (north of Chicago) also boasts a life-sized mastodon statue to commemorate Lake County discoveries that occurred on three separate occasions, in the years 1876, 1925, and 1992. Scientists estimate that mastodons became extinct some 11,000 years ago. Theories that explain their demise include climate change, habitat loss, disease and extinction from human hunting. So, for an interesting field trip this year, consider visiting the Philips Park Visitors Center and Mastodon Gallery and/or the Lake County Discovery Museum for outdoor activity, artifact viewing, and the irresistible, corny photo-op. It'll add some perspective to your life! With Pablo who was looking for bones! *Thank you to David Ratowitz for the haiku! "This proclamation is a great thing, perhaps the greatest thing that has occurred in this century. It is too big for us to realize." -- Richard J. Oglesby defends Abraham Lincoln's Emancipation Proclamation before a Union Party meeting in Springfield on January 9, 1863. On October 3, 1862 in the Battle of Corinth (Mississippi), Richard Oglesby was shot in the chest below the left armpit. He returned home to Decatur, Illinois where he was expected to die. 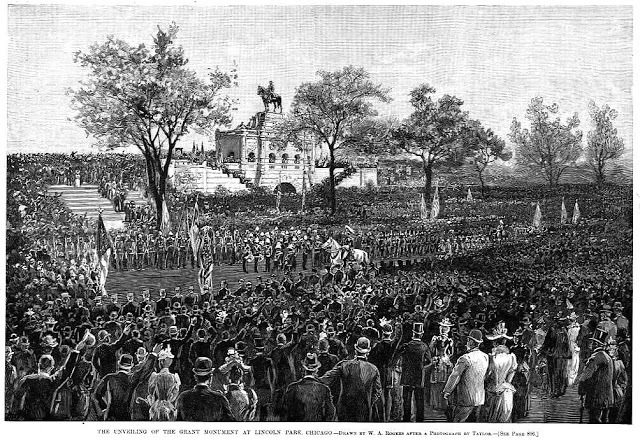 An article titled "Gen. Oglesby is Dead" was published by the Republican Illinois State Journal on October 9th. Oglesby read his own obituaries and likely surprised a few folks with the news of his returning health. 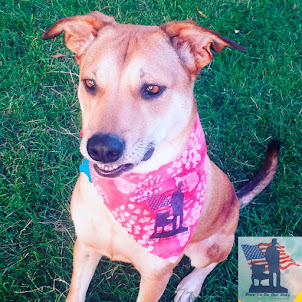 As his strength returned, he focused on how to continue his support of the Union Cause. Oglesby bronze on a knoll, north of North Pond, Lincoln Park, Chicago. January 1, 1863, Abraham Lincoln issued the Emancipation Proclamation, and the following week, against the advice of doctors, Oglesby travelled to Springfield to speak "with great difficulty" before the Union Party's mass meeting, held in the Hall of Representatives. 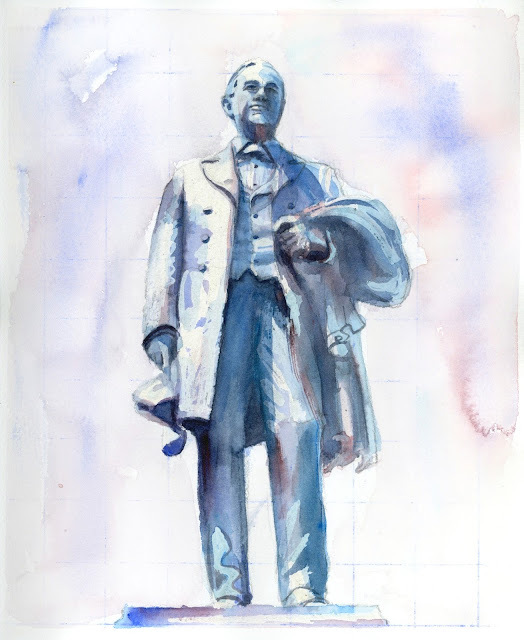 He called for "self-sacrificing patriotism," support for the Union troops, and he defended Lincoln's Emancipation Proclamation. The Oglesby monument includes a bench and a wall behind that once sported a bronze plaque which documented Oglesby's accomplishments. This record of Oglesby's career was said to have read like a romance, before it was vandalized and lost. I imagine Lincoln and Grant would have welcomed the company of Oglesby since both were fond of him. 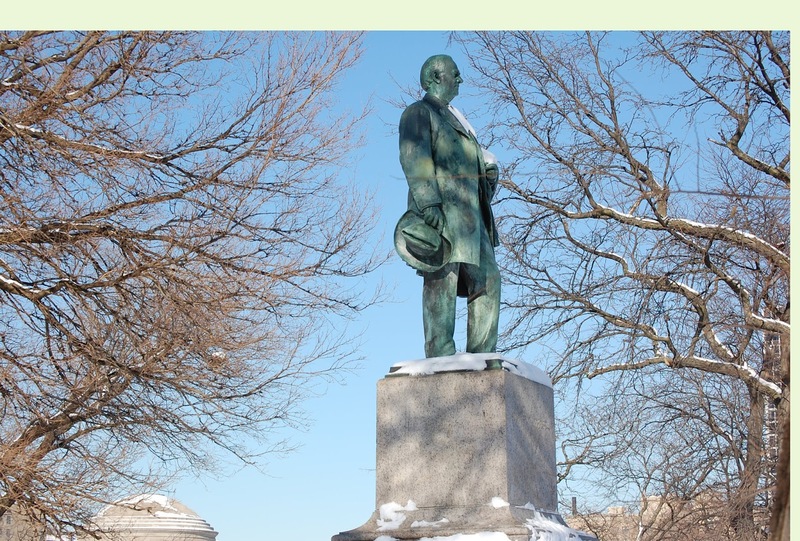 Perhaps Grant would have chuckled that Oglesby (known for his entertaining speeches that lasted for hours) was now a silent giant of Lincoln Park. Grant indeed once joked that forced silence would be the greatest punishment that could be inflicted upon Oglesby. So look for the Oglesby bronze high on a knoll just north of North Pond -- next time you're in the neighborhood. Take your own self-guided Lincoln Park monument tour with the help of my book Giants in the Park; join my bike tour over the summer (1st one this year on Mother's Day offered through Chicago History Museum), or for two minutes, view a short excerpt from my virtual sculpture tour below. Enjoy the tour! 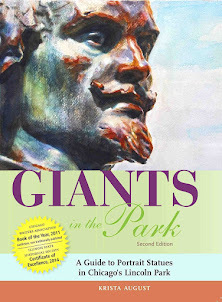 Giants in the Park books, lectures, tours, and art.